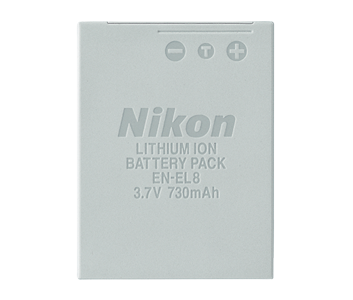 Buy New Nikon EN-EL8 Rechargeable Li-Ion Battery for Nikon Coolpix P1, P2, S1, S2, S3, S5, S6, S7, S7c, S8, S9, S50, S50c, S51, S51c, S52, S52c & MH62 Malaysia At FotoZZoom! A slim and compact lithium-ion battery that powers specific COOLPIX models for approximately 200 pictures per charge. It can be recharged repeatedly using the compatible MH-62 battery charger. Compatible for for Nikon Coolpix P1, P2, S1, S2, S3, S5, S6, S7, S7c, S8, S9, S50, S50c, S51, S51c, S52, S52c.